Affinity Chromatography is a collection of papers that presents the advancement in various areas of affinity chromatography. 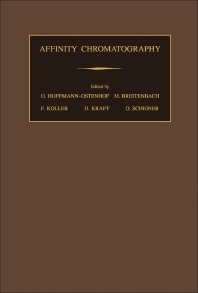 The title particularly covers the development in affinity chromatography in the context of biochemistry and immunochemistry. The text first details gel matrices, coupling methods, and charge transfer chromatography. Next, the selection tackles the affinity chromatography of enzymes and hydrophobic interaction chromatography. The text also discusses matrix-bound antigens and antibodies, along with matrix-bound lectins and affinity chromatography of cells. Part VI deals with affinity chromatography of hormone receptors, while part vii talks about affinity techniques in the isolation Of DNA, RNA, and polysomes. The book will be of great use to students, researchers, and practitioners of biochemistry.